This menu highlights the incoming warmer weather and fresh produce hitting grocery stores and farmers markets across the country. This meal is elegant and can be at least partially prepared ahead of time – definitely the endive appetizer and asparagus salad. The meal is light and fresh, but still hearty and sophisticated. Omit the steak and you can have a tapas-style picnic lunch for some al fresco dining! 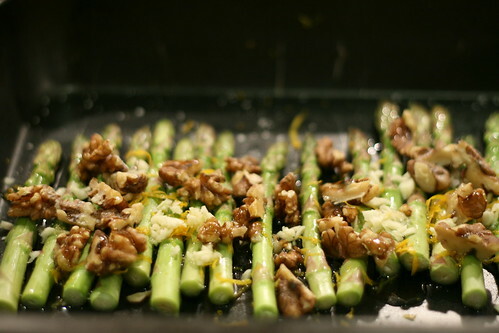 Grilled Asparagus Image by Missy and the Universe on Flickr.